Welcome to Idrabeton Decking Suppliers, the home of composite decking and garden ideas. Composite decking offers a complete solution to solving the problem of installing virtually zero maintenance long lasting decking in any garden area. The nature of composite decking means that it is resistant to the effects of damp, mould, fungus and infestation and it can therefore be used in any garden location. The reason that composite decking is so durable is that it is made of re-cycled wood and plastic polymers. It is therefore much more hard wearing and resistant to deterioration than traditional timber decking. Because of this it can be used in any area of a garden so long as the surface is sound. Uneven surfaces are not a major problem as compensation can be made for this when building the decking framework. Building with composite decking is carried out in the same way as with traditional timber decking. The same tools can be used and the decking boards cut in the same way as timber. Some types of composite decking are available with advanced methods of fixing the boards for an even better finish. Composite decking is available in two forms; one is uncapped and the other capped. Capped composite decking has been covered with a coating of material that makes it even more durable and resistant to deterioration and wear. 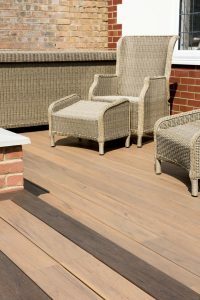 Usually the capping will contain chemical agents that are resistant to ultra violet light; this means that the decking boards are much more resistant to colour fading from direct sunlight. Capped composite decking is not only highly resistant to damp, mould, fungus and infestation it is also hard wearing and less vulnerable to staining and scratching than uncapped composite or timber decking. Because of these properties it is suitable for use in all areas of a garden, whether in direct sunlight or shade, in the open or under trees or bushes. Maintenance is very low which is another advantage. Capped composite decking can be easily swept and washed down without concern that the process will cause damage. There is no need to repaint or re-varnish as there is with timber decking. Composite decking is available in a variety of colours, patterns and finishes so there is something available to suit every taste. Similarly the variety of composite decking available makes it easy to choose a style that compliments the area in which it is to be built, whatever the surroundings. Because of its hard wearing nature and the variety of colours patterns and styles in which it is available, capped composite decking is an ideal choice for constructing decking areas in any part of a garden.